[Episcopal News Service] Episcopal congregations have plenty of tools they can add to their outreach toolboxes: canned goods, used clothes, a warm meal, a place to sleep, coins for the laundromat, backpacks for students and sometimes just the patience to listen. At St. Mark’s Episcopal Church in Corpus Christi, Texas, the tools of outreach include actual tools. But no carpentry experience is necessary. 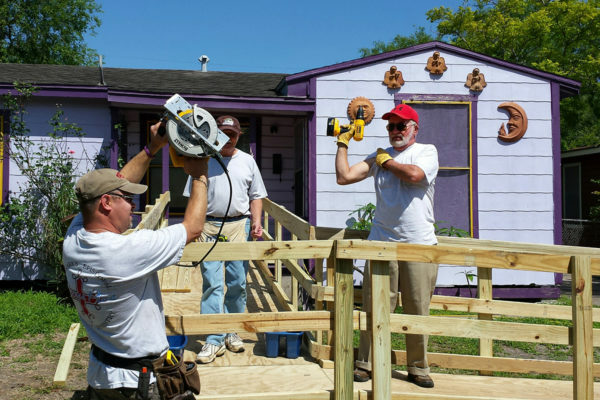 “Anybody who can operate a battery-power screwdriver can help us,” said Doug Wayland, who leads the congregation’s Access Plus outreach ministry. 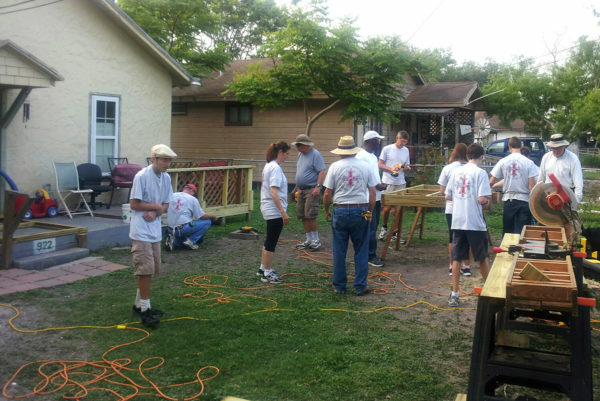 For 17 years, Access Plus volunteers have gathered at least once a month to build wheelchair ramps for residents in need, and the ministry is still going strong. With 218 ramps completed, Access Plus is increasing the number of projects it takes on this year after receiving $12,000 from a local foundation. That money will pay for a lot of ramps, with the typical ramp only costing $150 to $600 in materials. As for who is served, there is no typical ramp recipient. 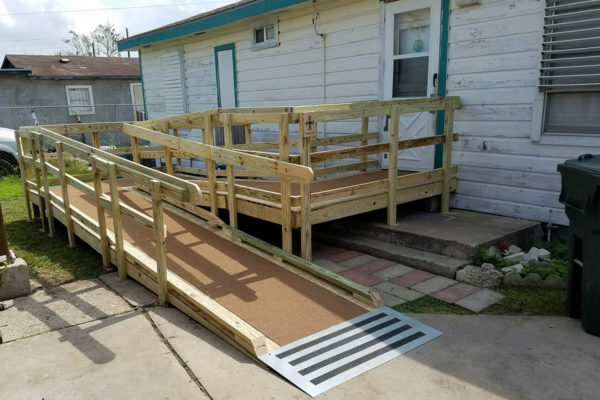 A boy suffering from bone disease and an elderly woman with a walker will both benefit from the improved access and mobility that the ramps provide. The work reminds Wayland of the passage from Matthew 25 in which Jesus says serving “the least of these who are members of my family” is service to God. “When we’re doing this, we’re doing this for the Lord,” he said. 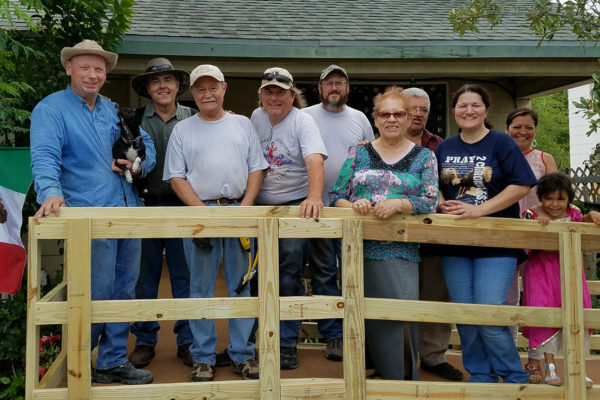 St. Mark’s is one of five Episcopal churches in and around Corpus Christi, a city of more than 300,000 people, and each congregation has supplied volunteers for Wayland’s Access Plus team, as have congregations from other Christian denominations. The Rev. John Hardie, rector at St. Mark’s, makes a point to describe the builds as ecumenical events. Outreach has been a major part of St. Mark’s identity since the congregation formed in 1986 as a church plant. One of its founding principles was that 10 percent of annual income would be devoted to outreach. Thirty years later, that now adds up to $35,000 to $45,000 a year invested in Access Plus and the church’s various other ministries. Hardie became rector in 1999, and the idea for Access Plus developed during a trip to Diocese of West Texas offices in San Antonio with parishioner Dik Johnson, a Navy veteran who had lost the use of his legs due to a spinal defect. As adept as Johnson was at navigating in his wheelchair, the restaurant where they stopped for lunch and the diocesan offices still were not as accessible as they could have been, Hardie said. Later that day, on the road back to Corpus Christi, they began to talk about Johnson’s experiences. Out of that conversation, Access Plus was born in 2001. “It was just a Holy Spirit moment, when both of us felt that God’s asking us to do this,” Hardie said. They enlisted another parishioner, Jerry Pierce, who was an engineer by trade. He and others at the church had been involved with Habitat for Humanity projects, but they were looking for a new ministry to call their own. Pierce led the design and construction of the wheelchair ramps. Wayland joined the team later that first year. The “Plus” in the ministry’s name initially was meant to encompass other handyman services, such as painting homes and mowing lawns, but the work of Access Plus never broadened beyond the wheelchair ramps. “What the ‘Plus’ became, and has become more recently, is just the way we involve more people,” Hardie said. A Roman Catholic church group, for example, asked to help build one of the ramps to broaden its own outreach ministries. And St. Mark’s team taught a Rotary Club how to make the ramps, and the club now makes about 10 ramps a year, Wayland said. 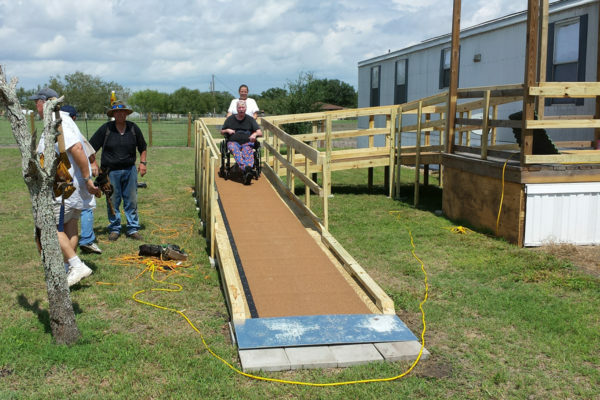 From the start, the goal for Access Plus has been to construct at least 12 ramps a year, with a team of a half dozen or more volunteers gathering on third Saturdays for their monthly projects. Johnson was a constant presence at the worksites until his death in 2011. He was known for bringing doughnuts around for the volunteers. Pierce moved to the Houston area after he retired a few years ago, and since then, Wayland has taken the lead. Wayland maintains a list of at least 30 people who are waiting for one of Access Plus’ ramps. As he makes his way through the list, he visits each home to determine what size ramp his team will build. The rule of thumb is a foot of ramp for every inch of vertical drop. If a resident’s steps are 24 inches high, that will require a 24-foot ramp. An 8-foot section costs about $150, and Wayland’s design also includes a flat section at door level, as well as in the middle of the ramp if the ramp includes turns. Wayland, also retired now at 62, fills up the church’s enclosed trailer with the necessary boards, plywood, screws and galvanized steel (for the ends of the ramps) that he picks up from MG Lumber in Corpus Christi. All of the cutting and assembly happens at the worksite, and even with that labor, most of the projects are completed in a matter of hours. “We start at 8 o’clock in the morning, and we’re usually always gone at 1 o’clock in the afternoon,” Wayland said. Smaller ramps take even less time. Access Plus’ project No. 218 was a three-foot ramp that Wayland made by himself Feb. 28 in his garage and installed at the house of a local woman. The 2017 budget for Access Plus was about $8,000 from the church’s pool of outreach money. This year, Wayland’s team hopes to take on 20 projects with the money it received from the Ed Rachal Foundation. Every project concludes with a blessing. Hardie said the people receiving the ramps are asked if they belong to a local congregation and have a pastor they wish to invite to say the blessing. It need not be an Episcopal priest, but if no one else is available, the blessing is led by the Rev. Bruce Wilson, who serves as the Access Plus chaplain. The need for these wheelchair ramps is “enormous,” Hardie said, and since a local TV station aired a news report on the ministry in February, Wayland has added two dozen additional names to his waiting list. “There’s no shortage of people asking for help,” Wayland said. Among the people Access Plus has helped are a man who lost both legs above the knees, a couple who both use walkers, a Vietnam War veteran who suffered a stroke, a girl struggling with the effects of multiple sclerosis and a child suffering from brain cancer. He has been amazed by some of the obstacles people in wheelchairs have to clear just to get into their homes. One woman who had lost one of her legs showed him her elaborate routine, which involved pushing her body out of the wheelchair and positioning herself backward and halfway inside the doorway, so she could pull the chair in with her over the step. What an amazing ministry. I hope it will catch on throughout the whole of the Church. As an Episcopalian and disabled person, I say THANK YOU for all of us who tend to go “un-noticed”. My husband and I are fortunate to live in a ground floor apartment (we both have MS), but I would hope my parish would do something similar if we needed it. I agree, Brian, what a wonderful, heart-warming thing to do. I worked with these guys as an unskilled volunteer on one project. These guys have ramp building down to an organized, highly efficient skilled/science/art form. A well oiled machine. They have a support trailer that is extremely well organized; required project materials and tools, pre-buiIt jigs are all in organized sections of the trailer. Every item has its own place. They know exactly what order tools are to be taken out and put back in. The basic construction steps and material dimensions involved in building the ramps are highly repeatable, ergo lending the construction to achieving great efficiencies. I was amazed at what they are able to accomplish in such short period of time. This is a ministry that could easily be cloned/franchised by other churches anywhere. All it would take is a grant/donations to get started with the appropriate materials, tools, a core skilled leader/organizer, a couple of skilled to semi skilled helpers, and willing volunteers. A very gratifying experience for someone wishing to volunteer on a worth while project. Any church/organization wanting to start new group like this could work with these guys on a couple projects to get the swing of things and lessons learned, and be off and running. As St. Marks has found, there is a real fundamental need, they have no lack of projects. Will gladly volunteer on this ministry again. God bless them.